c) you only live once. c) and my introverted self suffered from too much work-related human interaction lately and craved some serious alone time. 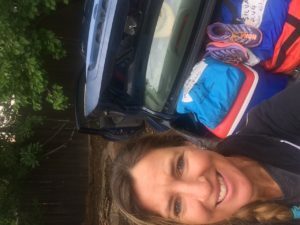 In early June, I drive to Lake Cuyamaca from New Mexico, partly because I hope the long solo road trip will mentally prepare me for the long solo run and partly because I am worried about organizing all my drop bags and gear for a 100-miler into a piece of luggage suitable for air travel. Like many other runners, Rachael and I pitch a tent near the start/finish line on Thursday. The weather forecast predicts A rcord high near 100 degrees for the weekend. I had looked forward to warmer temperatures , but this seems a little excessive. We prepare our packs, pick our outfits, lube our feet, and slather on sunscreen before walking to the starting line on Friday morning. Scott Mills, the enthusiastic and organized RD, begs us to be smart out there in the heat of the day, then sends us off at exactly 6 am. I start near the back of the pack, but feel so good for the first few hours that I pass a bunch of people. 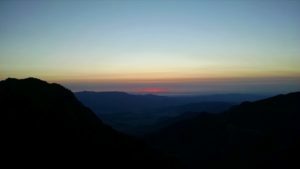 But by mind-morning, we’re climbing a section of the PCT. The dry air keeps getting hotter. The shrubby vegetation offers no shelter from the brutal sun. 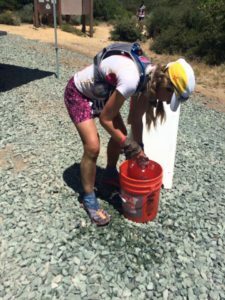 I stuff my hat and sports bra with ice at every aid station, which helps for a couple of miles. The aid stations in this race are seven to nine miles apart, so the ice doesn’t last. I glance behind me and see a by now familiar woman named Gretchen in a cowboy hat gaining on me. I am not willing to give up my position in the field, wherever it may be, so I try to quicken my steps when my left calf muscle cramps mid-stride, in protest. 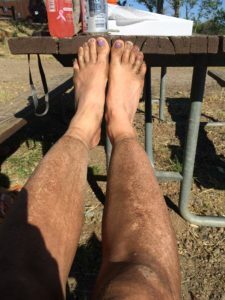 I land in the dirt with a graceless thud, murmuring expletives and massaging my calf as Gretchen passes me, graciously offering to help me up. I wave her on as I struggle back into an upright position, swallow a couple of salt pills, and get going again. This race is like the canyon section at Western States, except that the canyon section here is 85 miles long instead of 30. The heat starts earlier and lingers later, zapping runners of all energy. Around mid-afternoon, I climb up the so-called Noble Canyon. There is nothing noble about this thing. It’s rocky. It’s steep. It contains a trickle of water too shallow to cool off in, and mosquitoes the size of hummingbirds who are feasting on my blood. The heat of the day has reached its peak. I later find out that the canyon floor reached 110 degrees fahrenheit. Dried sweat has formed a layer of salty residue on my skin, where it mixes with the fine desert sand into a grimy layer. Salt stings my eyes. My stomach is lurching into dry heaves. The rocks seem to be moving in circles, like a reddish kaleidoscope. My powerhike slows to a stumbling shuffle, yet I pass a couple of people who have stopped moving altogether. A chilling sound to my right propels me forward. A rattlesnake is coiled on a rock, just a couple of feet away. I thank it for making me move faster, if only for a minute. My 70oz bladder of watermelon-flavored Nuun is barely enough to get me to the next aid station. Feeling like roadkill, I reach Penny Pines. It’s only mile 44, not even half way done, but I sink into a chair. I consider dropping. I consider calling David, who is posting facebook updates all day and all night, to tell him it’s not my day. But as my core temperature normalizes, things seem less dire. My usual nutrition strategy is a mix of clif bloks and stinger waffles. Today, I can’t stomach either, so I switch to potato chips and ginger ale, which at least stays down. Only 56 miles to go. It may not be my day to place in the top five, but I can still finish. It’s time to throw out plan A and go for plan B, which is to stay under the cutoff time, upright and in one piece. Evening is just a few hours away. If I can hang on until sunset, I can get this thing done. It’s evening. The sun is setting in a blaze of reds and purples on the horizon, which means the heat of the day is winding down. I pick up my lights. 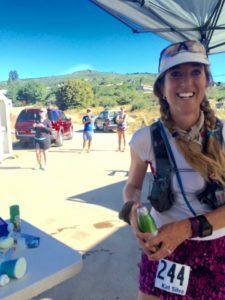 Anxious friends and family members huddle around their runners like pit crews at a formula one race, while I – in the stupid category – fumble around in my drop bag, looking for fresh socks and blister bandages. This is also where crewed runners can pick up their first pacer. A woman named Tia leaves with her friend at a brisk pace,which makes me regret my solo status. On the plus side, my appetite has returned, and a quesadilla tastes like heaven. My energy level surges as I run the long, gradual descent into Cibbets as darkness falls. There’s a spring in my step as I pick up my pace, passing Gretchen, Skye, and Tia. This is an out and back section, and I realize, counting three women on their way back, that I am in fourth place now. I can still finish in the top five! My competitive instinct returns with a roar. Knowing who is in front of me and behind me gets me in and out of the aid station within minutes. I spend most of the climb back up in pleasant conversation with a guy named Mark. There’s enough of a chill in the air to pick up my jacket at on the return pass through Dale’s kitchen. Rachael is there, nursing a shin injury and considering a DNF. I hug her, but don’t linger because of three fast women breathing down my neck. Mile 80, twenty more to go. Ahead of me, a strong-looking grey-haired runner has doubled back, looking for course markings. I realize with a start that I haven’t been paying enough attention to the trail. We look around for a few minutes until we spot a pink ribbon on a tree branch. A beautiful sight. Reassured, we continue on together, making small talk interspersed with the grunting sounds that mark the late miles of a 100, when he turns around and asks “Do you know who I am?” I know I should say yes, but my tired brain won’t give up the information until he reintroduces himself as our campsite neighbor Rob, just shy of his 60th birthday, on his way to an impressive sub-25finish. My surge of energy is over by mile 85. 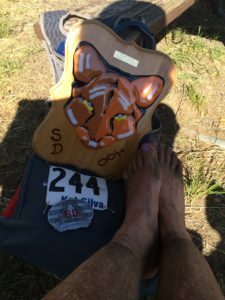 My blister intervention at mile 72 consisted of sticking a couple of band-aids onto my dirt-covered feet. They came off a few miles later, and by now I feel like I am running on raw, bleeding soles. Only the competitive instinct keeps me moving at a slow jog. The light of dawn edges up in the East. Time to turn off the lights. I walk, force myself back into a jog, walk again. At this stage, having a pacer can make a big difference. I am in the solo (or the stupid?) division, so I have to make do with an imaginary pacer yelling into my ears to keep moving, dammit. 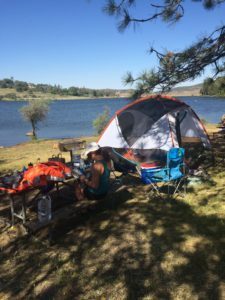 The last few miles are on gently rolling terrain, but difficult to deal with because they meander through meadows and hills near Lake Cuyamaca, suggesting the finish line is closer than it actually is. They seem endless, looping around familiar ground without leading home. The last mile serves as a final insult. The finish line is almost close enough to touch it, certainly close enough to hear cheering crowds. Just as I think I am almost done, a sign appears, announcing “one more mile to the finish!” upon which he trail loops in the opposite direction one more time. Demoralized, I glance behind me. No sign of Tia, Skye, or Gretchen. My feet are on fire. I break to a walk, then force myself to run the last 100 yards and across the finish line in 25:05, 4th woman. A long, unforgettable day Is over. Thank you, Scott Mills, for excellent organization, extra ice at all the aid stations, and for the confidence ribbons. Thank you, Rachael, for sharing your tent and the weekend. Thank you, David Infante, Michelle, Rob, Mark, Skye, Gretchen, and Tia for conversations and company. Thank you, David Silva, for cheerleading from home. I now have a couple of weeks to doctor my blister-covered feet before the Lavaredo 119k. Yes, running two major races so close together seemed like a good idea when we signed up. As usual, I blame Rachael. It is a good time to be alive and running, blisters and all. This entry was posted in Uncategorized on June 11, 2016 by silvakat. Loved the write up. I concur with it all whole heartedly. Nice to see you out there. 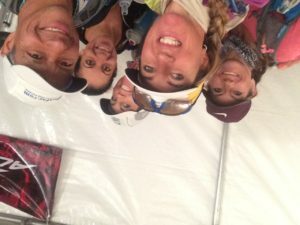 Great account of another stellar race! Congrats again, Katrin. Nice work! That heat dropped me at mile 44 in 2013. Brilliant writing. Hey Greg, thanks for the compliment. That heat almost dropped me at mile 44, too. Will you come back next year to finish the unfinished business? Thank you for reading, and good luck in San Diego. It’s a beautiful course. Enjoy every minute!